I love when the best ideas come from normal-everyday conversations. Like this one for umm...hello...TANDOORI GRILLED CHEESE!!! Why hadn't I done this yet? It's so freakin' easy, and it's the epitome of Indian fusion and a take on Indian street food. The idea happened after my coworker asked me to bring him some tandoori masala, and since I have a Costco-sized container at home so I said, "Of course, please take as much as you want!" Two days in a row I forgot to bring in the masala, and definitely got crap for it. However, I did remember eventually so don't worry the work relationship is salvaged. Right after this happened I was with a girlfriend (who religiously follows my Insta) getting my nails done, and after a couple glasses of wine the idea of a tandoori grilled cheese hit the table. So here is the Mom Under Pressure version of good ol' grilled cheese and tomato soup. 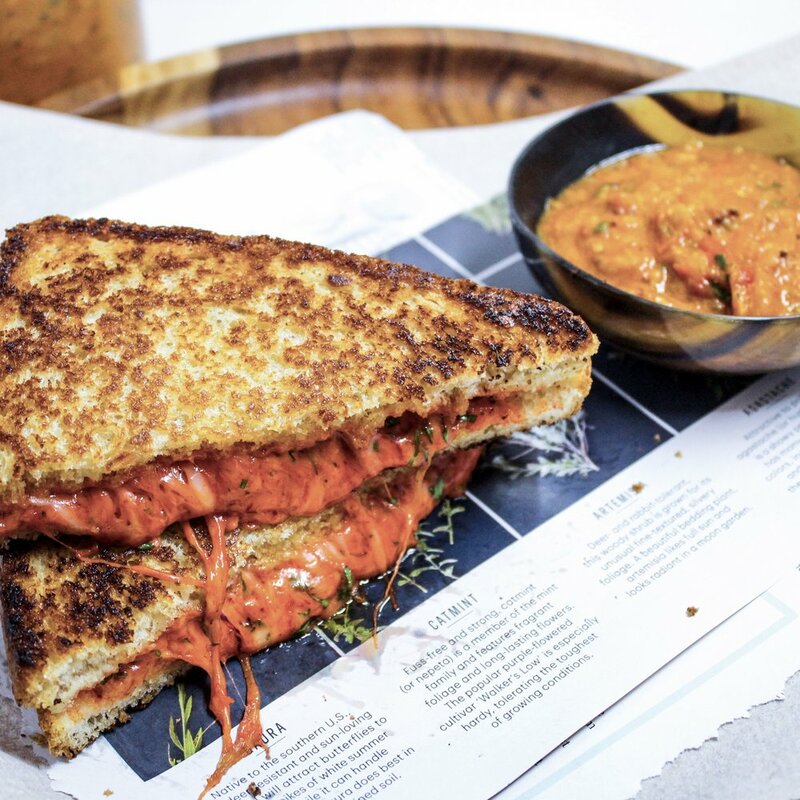 You will love the subtle flavor of tandoori spice in your grilled cheese with the traditional Indian flavors in this homemade tomato chutney that I've had growing up. So nostalgic...all of it...for any culture...in my opinion! And while on the subject...what do you guys think of those nails? Some people thought I dipped my fingers in a bowl of turmeric! For the grilled cheese combine shredded cheese, tandoori masala, and mayo in a bowl. Build grilled cheeses by buttering the outsides of thick cut bread and placing 1/3 of the cheese mixture between two slices of bread. This makes about 3 sandwiches, but you can use as little or as much cheese mixture as you want! Melt more butter into a cast iron skillet and cook over medium-high heat. Cook until the cheese is melted, and the bread is nicely golden brown and crunchy! To make the tomato chutney heat 1 tablespoon of oil in a pot. Add mustard seeds and cook until they are fragrant and popping. Add onion and cook until soft and translucent. Add the rest of the ingredients except for the cilantro and mint. Cover and cook on medium heat until the tomato has cooked down and is easily mashed with a fork. You will notice that the skins of the tomato have pulled away from the flesh.If the chutney has cooked down to a consistency thicker than you like you can add a little water to adjust. Once done, remove from heat and add cilantro and mint. If you do not like the texture of the skins you can blend the tomato chutney to a consistency that you prefer.